This small campground would be the place to be during the summer beach season (if you can get a reservation). A short 300 yard walk to the beach with easy access provided by two walkways across the dunes. Showers are located at the edge of the base to rinse off the sand and salt before returning to your RV. The campground appears to be a mobile home park that has been converted to a campground which also has several modular homes that serve as beach cottages. The sites are not close together and each has a concrete pad and driveway. The water and electric utilities are on the wrong side but this can be overcome by running your hose and power cord under your RV. In some sites the sewer connection is also on the wrong side. If you have a motorhome, you could drive in (not back in) and eliminate these problems. There is a bathhouse and laundry. The showers are located in individual rooms with sink and toilet, providing maximum privacy. The $25 daily rate would be appropriate for the summer season but, in my opinion, is too high for other parts of the year. Fort Fisher is located near the end of the highway and, except for the typical beach shops and restaurants, there isn’t much down here. The aquarium and Fort Fisher are nearby. The nearest Wal-Mart is 12 miles back toward Wilmington. Visit Jack Mackerel’s restaurant for some great seafood. During our visit, they were offering 40% off on Wednesdays, a real bargain. We were meeting family on their beach vacation and this was a perfect location. Proximity to beach was good enough. We would return if we wanted a beaching site. Overall, this is a nice place. There isn't any security. Anybody can come in the campground. Anyone can go fishing on the pier. Anyone can use the restrooms or showers unless a camper steps up and says no. There are a lot of house trailers here. They are working to improve them. I found some of the hook-ups for RV's are quite odd in some sites. Water on wrong side, electric or cable far away. It's just weird. But it is close to the beach if you like the beach. There are some very reasonable golf courses near which is a plus to me. The staff was very helpful and sincere in wanting to provide a nice experience. That's a great plus!!!! Sunsets on the Cape Fear River were wonderful!! Great location. Facilities are nice with pool, snack bar, etc. Nice pier on river side for fishing. Have to go across the highway and thru beach houses (only at public entrance areas) to get to the beach. Campsites are nice but a little tricky. 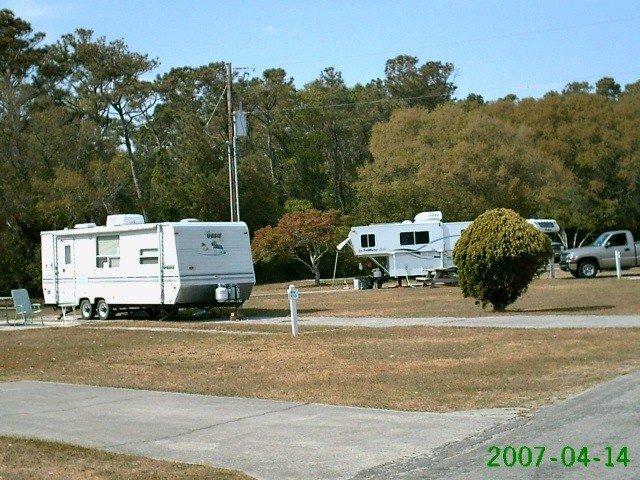 Sites were originally a mobile home park and the homes faced each other - therefore, on some sites, to get the use of the patio you have to park your RV backwards which may put hookups on other side. However, overall a very nice facility and we definitely will return. Cabins are old base housing and according to the staff are scheduled to be torn down at the end of next season and new ones built. Staff was very nice and helpful. E.R.E. left this review using the Directory software: - Nice Campground. Take the ferry to Oak Island. L.A. left this review using the Directory software: April is still the winter season so the recreation facilities and restaurant were closed. The restaurant did open for a few hours on Easter weekend. We stayed in lot 26 next to the dump station. The camp overall is clean and comfortable but the restroom/shower facilities are getting very run down. It is obvious that MWR isn't putting any money into maintenance or improvements. As mentioned in other reviews, depending on the assigned camp site, it can be a long way to the hookups. We arrived about 6PM and found we had to make a quick trip to WalMart (almost 20 miles one-way) to get water hose and an extension cord. Water and electric hookups are nearly 75 feet from trailer site 26. Sewer is about 20 feed. The office crew was friendly and helpful but don't be surprised if you have to move your camper at least once during your stay. It seems they find it easier to juggle campers around the sites rather than juggle the calender to slot campers according to length of stay. I know this sounds negative, but in spite of the shortcomings, we really enjoyed our stay at Fort Fisher and will most likely visit again. Great place to take in the ocean. Gives you a feeling like the outer banks but not as commercialized. Great restaurant called the treehouse.tappa food. Only negative is the dump station by the office. They have a orv-26 site connected with with RV dump PVC pipe. When we were there an RV was at this site. There is no way I could have moved my 5th wheel close enough to dump. Thank goodness I had a portable sewage tote with me or would have had to leave a week early and find a dump station else where. They need to do away with orv site-26. We liked this RV Park. It's quiet and roomy. The laundry room is with the bathhouses but it's not marked. It's the last door on the left side of the building. It's air conditioned and really pleasant inside. I brought a chair and my laptop while I was waiting for my laundry to finish. Two washers/two dryers at 75 cents each. We loved the beach access within walking distance. There are many free public parking lots for the beach if you'd rather drive. Boarded the ferry when we left the campground as we were headed south--our first ferry ride ever. It's $15 but better check ahead of time for the schedule as we had an hour wait. We paid $15 for the truck and 5th wheel. It's a 30 min ride on the ferry and you can sit in your vehicle OR walk about the boat. You CAN drive south if you want but you have to go through Wilmington which would take you about 1.5 hrs to accomplish the same thing that the ferry will do. When we saw all the neat shops and antique shops after we got off the ferry and into town, we wished we had taken a day to do that while we were at the RV park but we didn't have time once we got on the road as we had a deadline to meet. 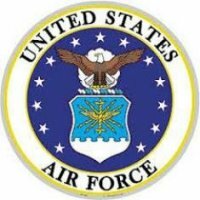 There is no military gate at the RV park. Cable TV gets over 100 channels which is a PLUS in our book! Intermittent drops w/Verizon cell and aircard but not too bad. Brought the family down with a pop up camper. The staff was terrific and our fellow campers were friendly and polite. We had a very quiet "overflow" spot that worked out perfectly for us. We enjoyed the beach access the most and used the pool and fishing pier as well. We enjoyed our stay and will camp there again when we get the opportunity. New bath house and laundry room have been added. 4 complete baths, including sink, commode, and shower. 2 washers and 2 dryers @ $.75 each. Campground still has old mobile home hook-ups, but functional. You may choose to drive into the sites, instead of back-in because concrete pads for porch are on different sides for different sites. If you have a full black tank, they prefer that you use the RV dump in front of the reception center, due to old plumbing at the sites. Grey can be hosed into the sewer hook-up at site for continual drainage. AT&T aircard is sporadic, not consistent, which can be irritating. The number one positive about this campground is location to beach. A great value for $20 a night, considering what hotels and rental condos cost in this area. If you can imagine a beach access property owned by the military and good it might be, it is that terrific! The office is staffed by knowledgeable friendly people who will answer all your questions. While there be sure to visit the little military museum on the base. It's terrific. We were there during a time when the camp hosted an outdoor music event on property. It was free and fabulous! There are nice restaurants close by for your eating enjoyment. The beach is literally half to one block walk away. We love Ft. Fisher, having stayed in the lodge a lot several years ago, but this was our first time with our coach. It was a great stay. It is very quiet, the staff are friendly and helpful, and we love the beach and surrounding area. We were disappointed to learn that the Beach House restuarant and the Recreation Center would not be open until Memorial Day weekend. We had been looking forward to doing some kayaking and canoeing but they were not ready yet. The laundermat only has one washer and one dryer but at $.75 each, a bargain. The facility manager, Bill, had some great plans and we hope he can get the necessary funding to implement them. We suggest to everyone going there to ride bikes to the ferry, take the ferry to Southport, and bike around the town. The battleship USS North Carolina is a great place to take the kids, and for adults too. We definitely hope to go back again soon.